Best feature: No cars, ski-in / ski-out access and right in the middle of the Portes du Soleil! IMPORTANT INFO: Avoriaz is a car-free resort, which is great for the environment, but unfortunately means we can’t take you all the way to your accommodation. When you book transfers to Avoriaz, we will take you to the drop-off area and you can get a snow taxi or horse and cart to your accommodation from there. However, if you’re staying in Residence l’Amara, we will drop you off at the spa reception in the car park. 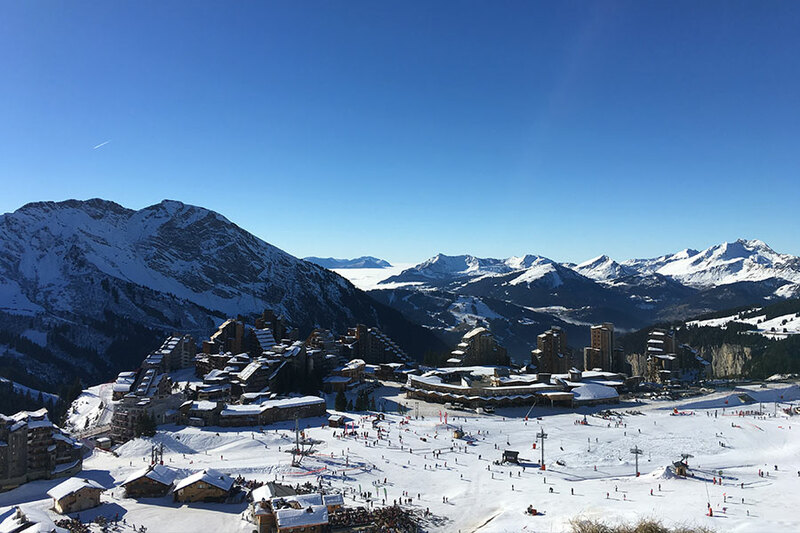 Avoriaz is one of France’s original purpose-built resorts, but it has the added bonus of actually looking quite nice, unlike some resorts we can think of! The angular wood-clad buildings were designed to blend in with the cliffs the town is perched on, and Avoriaz has won numerous awards for its environmental innovations. 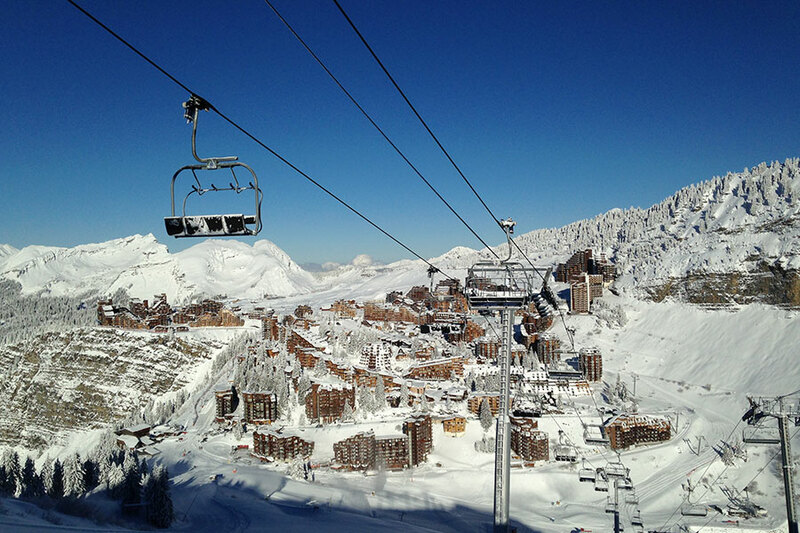 Avoriaz is set in the heart of the Portes du Soleil and has the best ski-in / ski-out access in the area. It backs onto the resorts of Châtel and Champery-Les Crosets and is just a bus ride or a short walk away from the Morzine and Les Gets ski areas, making it ideally located for any type of skier, from beginners to seasoned experts. While it’s known as a pretty advanced resort, there’s actually some amazing family skiing to be had in Avoriaz; it’s got two snow parks built specifically for kids, and plenty of wide pistes hidden in the trees that are ideal for taking the family down. Avoriaz has three other snow parks, including Europe’s first environmentally friendly park, The Stash, plus some amazing off-piste skiing, steeps and mogul fields. Book your airport transfers to Avoriaz HERE. Changabang: Right at the top of the Prodain cable car, Changabang is a laid back locals’ hangout that does the best lunchtime burgers ever. Make sure you try a bit of the home-spiced rum, too. La Boule de Neige: Snow-themed décor, friendly service and a cheap and cheerful (but still mega-tasty) dinner make la Boule de Neige one of our favourite eating spots. Le Yeti: This laid back bar is right next to the piste that runs from the Chapelle snow park to the Prodain cable car, expect live music, deck chairs a-plenty and hilarious people-watching. It also gets the best afternoon sun in resort. Le Tavaillon: A welcoming atmosphere and amazing après drinks specials. Wild Horse Saloon: A relaxing atmosphere and yummy bar food. The best place for a few quiet drinks before a powder day. Or is it…? The Place: The closest place (haha, get it?) Avoriaz has to a night club, The Place always has live bands and DJs, and is perfect for dancing the night away. Free Ride: Another branch of the Skiset empire, you can expect friendly, professional service and the best gear – to buy or rent. Aquariaz: An aqua park in the snow with an indoor climbing wall, outdoor hot tub and halfpipe-style waterslide. Fun for kids and even more fun for grown-ups. Bowling: The two-lane bowing alley in Avoriaz is hilariously small but highly fun – plus it has a selection of classic arcade games. Le Pas de Chavanettes: It may not be the cheapest restaurant on the mountain, but Le Pas de Chavanettes is an amazing place to get an espresso and watch people attempt the Swiss Wall. Hours of fun. The Igloo Bar: Made entirely from ice, the piste-side Igloo Bar smells a bit like the back of your freezer and is really cold, but it’s worth going just to say you’ve been in a bar made entirely from ice. It also has an impressive ice-sculpture gallery, and you can even stay there overnight. Book your transfers to Avoriaz HERE.